To celebrate David’s birthday (and his joining me in Madison, WI after two long weeks apart), I decided there could be nothing better than strawberry-rhubarb pie. Madison has a lovely farmer’s market every Saturday, with a plethora of fresh produce and cheese to choose from, so I was able to pick up some fresh rhubarb and organic strawberries. Preheat oven to 400 F. Combine the first five ingredients in a bowl. In a large bowl, mix rhubarb and strawberries with the dry ingredients until the fruit is well-coated. Let stand for 20 minutes. 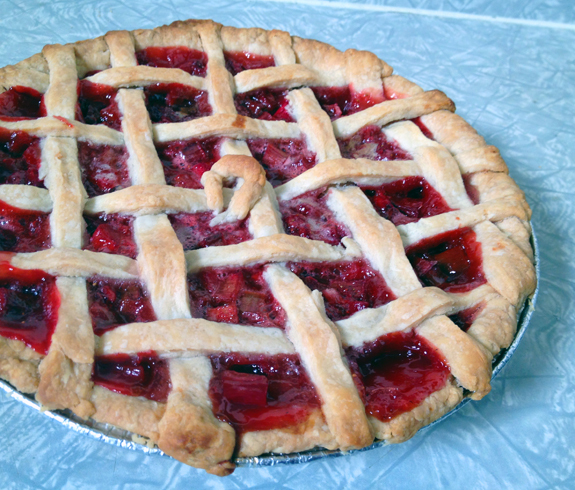 Meanwhile, roll-out pie dough and line a 9″ pie pan with the pastry, leaving enough pie dough for a lattice top. Fill the pie shell with the strawberry-rhubarb mixture. Dot with 1 tbsp worth of butter pats. Cover with lattice top pastry. Bake in pre-heated oven for 30 minutes before covering the edges of the pie with aluminum foil. Bake 15 more minutes before covering the hole with aluminum foil (when it’s light brown). Bake another 10 minutes or until filling is bubbling. Let stand at least one hour for the filling to set. A few notes on preparation: I couldn’t find tapioca pearls so I substituted 1/4 cup of tapioca flour at my mother’s suggestion. It was an exciting challenge to roll-out pie dough and bake in 37 C heat, but I soldiered through it. =) And the result of my slaving in a hot kitchen: yum! The pie was delightfully tasty–just the right balance of tartness and sweetness, with the scales tipped in the slightly tarter direction. I was pleased to discover that it tasted very much like my mother’s strawberry-rhubarb pie. Being David’s favourite kind of pie, he was more than happy to polish off three slices before noon, which I take as a good indicator of its tastiness. Wow, sounds incredible Angela! Will have to try before summer is gone!